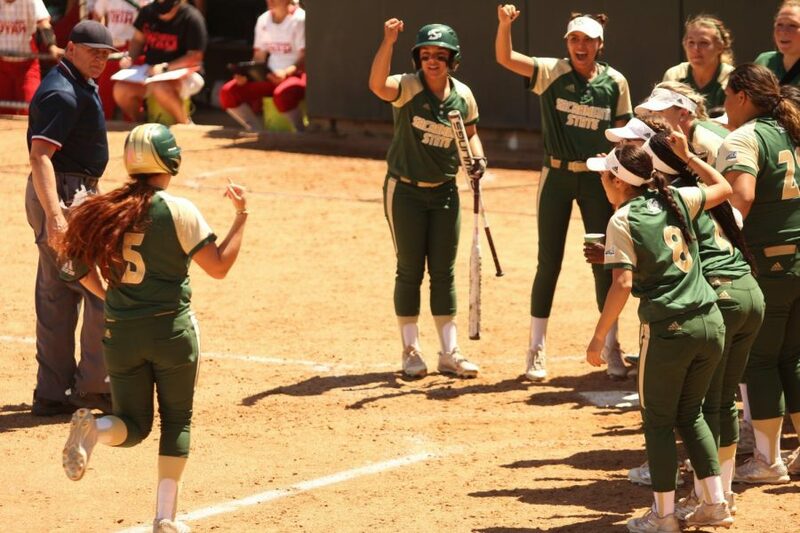 Sacramento State sophomore outfielder Suzy Brookshire and her teammates perform the University's signature "stingers up" hand sign after she hit a solo home run against Southern Utah University at Shea Stadium on Saturday, April 21, 2018. The Hornets defeated the Thunderbirds 2-1. 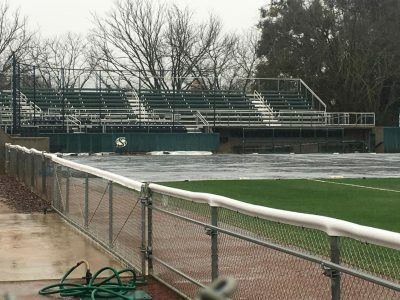 A pair of walk-off hits helped the Sacramento State softball team sweep Southern Utah University on Friday and Saturday at Shea Stadium. 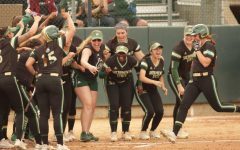 The Hornets (25-15, 10-5 Big Sky Conference) had their first walk-off hit in game one after a two-RBI double with the bases loaded from junior outfielder Sydnee Strong. 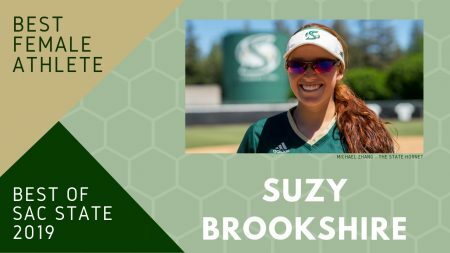 These RBIs gave the Hornets a 3-2 victory over the Thunderbirds (6-34, 3-12 Big Sky) in game one of a doubleheader on Friday. 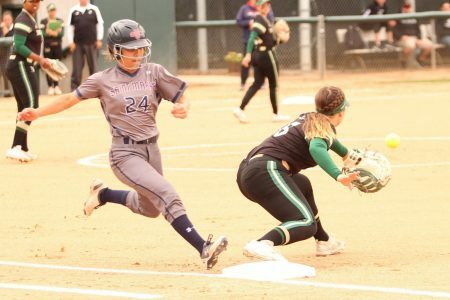 Strong, who went 1-for-4 with two RBIs, said she was irritated after the Thunderbirds intentionally walked sophomore outfielder Suzy Brookshire in favor of facing her with the bases loaded since she went 0-for-3 prior to achieving the game-winning hit. 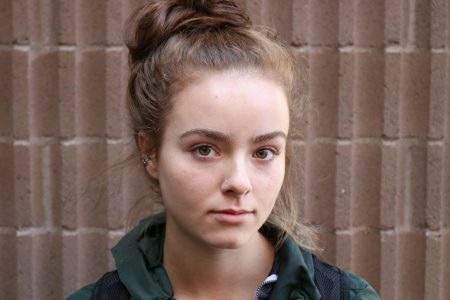 “I was like ‘I’m not going to let anyone beat me anymore,’ ” Strong said. “So, I kinda just dug my feet in and hit it hard. 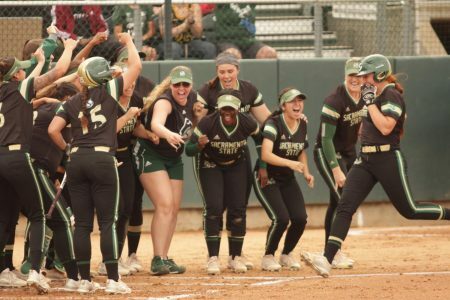 The Sacramento State softball team celebrates with junior outfielder Sydnee Strong, far right, after she hits a game-winning two-RBI double against Southern Utah University at Shea Stadium on Friday, April 20, 2018. The Hornets defeated the Thunderbirds 3-2. 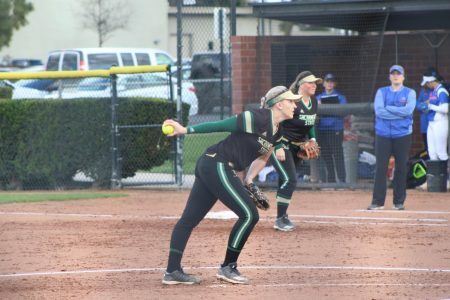 The Hornets — which were down 2-1 prior to Strong’s walk-off — made multiple changes to their lineup including senior pitcher Celina Matthias being put in the batting order. 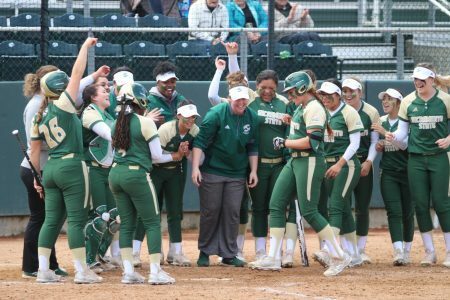 Sac State coach Lori Perez said she made the changes to the lineup to mix things up after struggling to get hits the past few games. “Sometimes when you don’t score runs like you have been, often times you have to reassess and determine if you’re pressing or not,” Perez said. “We had some conversations and tried to lighten things. Perez said Matthias, who hit and pitch prior to entering college, had a good fall season in the batter’s box last year and was working hard on becoming a better hitter at practice to potentially be used at the plate this season. 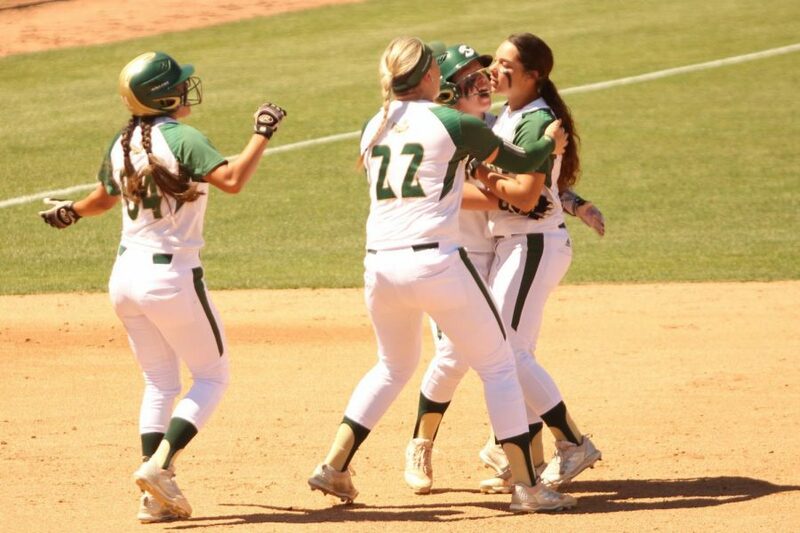 Matthias, who had one at-bat in her four-year career at Sac State prior to game one, went 2-for-3. Senior third baseman Marissa Maligad also went 2-for-3, while junior outfielder Nene Alas went 1-for-3. In the pitching circle, Matthias threw a complete game while only giving up two runs on five hits and striking out 11 batters. 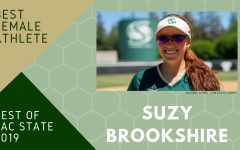 The second walk-off for Sac State came on an RBI single from junior Sydney Rasmussen with two runners on base to give the Hornets an extra (eight) innings win over the Thunderbirds in game two of the doubleheader on Friday. 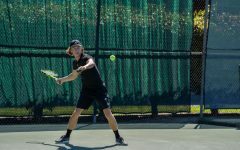 “I knew I had to at least put the ball in play to score (Strong),” Rasmussen said. “I had a rough day at the plate the game before (0-for-3 in game one) and I just made my own adjustments to the ball. 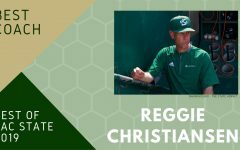 Rasmussen, who went 3-for-4 with two RBIs, also hit an RBI double in the sixth inning that gave the Hornets a 2-1 lead entering the seventh inning. 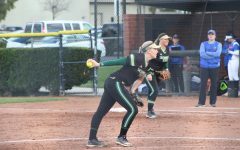 Junior pitcher Savanna Corr threw six innings, giving up one run on five hits and striking out six batters. 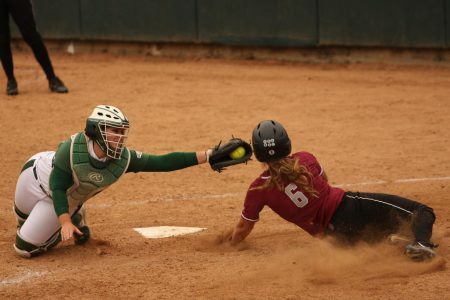 Matthias, who came in for Corr in the seventh inning, gave up an RBI double to senior center fielder Sarah Murphy which tied the game up at 2-2. Matthias then got the final out of the inning and pitched a clean eighth inning to help eventually lead to Rasmussen’s walk-off single. 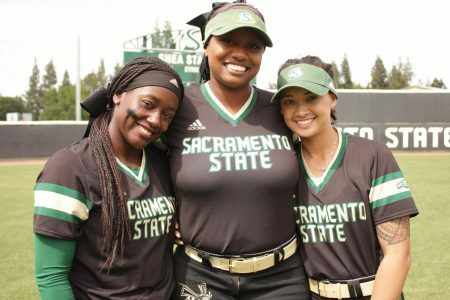 Sac State senior second baseman Zamari Hinton, Alas and Strong each went 1-for-4, while Maligad and sophomore first baseman Mo Spieth each went 1-for-3. 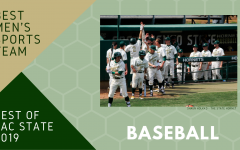 The Hornets then completed their sweep of the Thunderbirds following a 2-1 victory in game three on Saturday. Corr threw five innings, giving up one run on four hits with three strikeouts. Matthias — who came in for Corr in the sixth inning — threw two innings, giving up one hit and striking out four batters. Brookshire went 1-for-3 including a solo home run in the fourth inning. The home run, which was the go-ahead run for the Hornets, was Brookshire’s 12th of the season. Alas, who had an RBI, went 1-for-2 while Hinton, Rasmussen and Matthias each went 1-for-3. Perez said she was proud of how her team battled through each close game during the series. 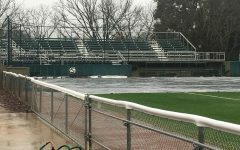 Sac State will next take on the University of North Dakota in the last home series of the season on April 27-28 at Shea Stadium.